If you’re getting ready for retirement or approaching your 65th birthday, you might be thinking about enrolling in Medicare, the U.S. federal health insurance program for people 65 and older. 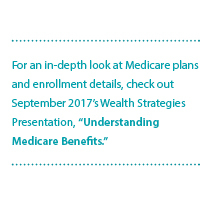 This month’s Wealth Management Insights walks through key details you should know as you make decisions about Medicare. Get to know the "ABCDs" of Medicare. Part A covers inpatient hospital care, skilled nursing care, home health services and hospice. Part D covers the costs of prescription drugs. Medicare Supplement (Medigap) plans help pay for some of the costs not included in Parts A and B like deductibles, copayments and coinsurance. Medicare Advantage (Part C) is an alternative way to get Medicare. It is a plan offered by a private insurer and often includes all of the services listed above. Your employment status at age 65 makes a difference. If you work for a small employer (fewer than 20 employees covered by the plan) when you turn 65, Medicare usually becomes your primary source of insurance coverage. Your company’s insurance will not kick in until your Medicare-covered expenses have been satisfied. However, if you work for a large employer (with 20 or more employees covered by the plan) when you turn 65, your employer’s plan will remain the primary payer of medical claims and Medicare will provide supplemental coverage. As you work to decide whether to stay on your employer’s plan or enroll in Medicare, think carefully about your healthcare needs and the costs of policies available to you. Take steps to avoid gaps in coverage. For example, you may find it easier to enroll in Medicare before your employer’s insurance coverage ends and designate when you want Medicare to begin. Don’t miss your chance to enroll in Medicare. You have three windows where you can sign up. The initial enrollment period is your first chance to enroll in Medicare. The window lasts seven months – it opens three months prior to your age 65 birth month and closes three months after your age 65 birth month. Most people enroll during this period, especially those with individual coverage and small-employer insurance plans. The special enrollment period is the best time to enroll for individuals covered by a large company insurance plan and have not signed up for Parts B or D during the initial enrollment period. The general enrollment period is for individuals who wish to enroll in Medicare but missed their initial and special enrollment periods. It runs from January 1 to March 31 each year, and coverage starts on July 1. However, you may incur a premium penalty for enrolling in this period and may experience gaps in coverage. Medicare is complex, and it’s crucial to understand the rules, plans and deadlines that apply to you. Your Baird Financial Advisor can help you understand and prepare for Medicare enrollment as well as work with you to identify the right plan for you.